Want to take on the Top End? 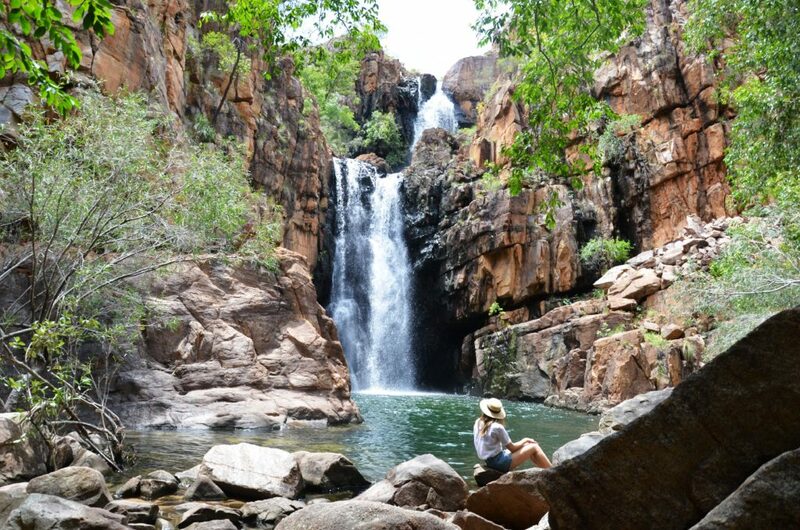 If you’re after waterfalls, wildlife and some seriously wonderful view (really, they’ll take your breath away), then the Top End is the place to go. 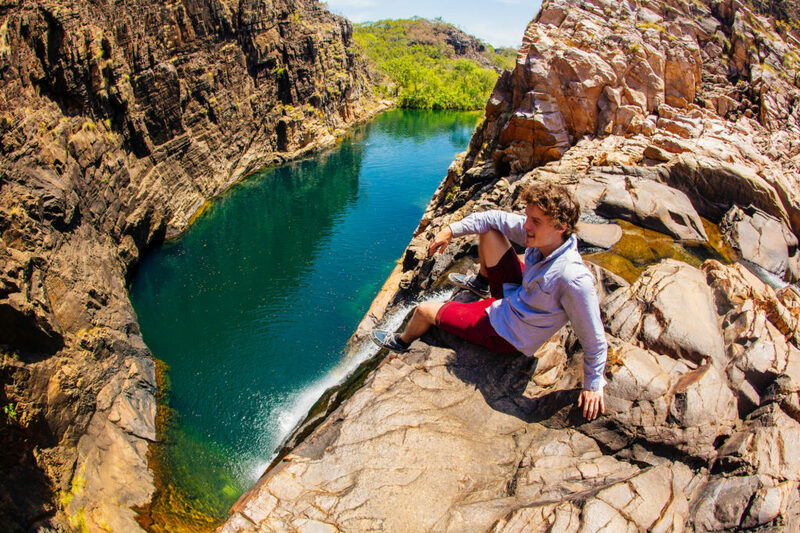 From bustling Darwin to the stunning Kakadu and Litchfield National Parks and the famous Katherine Gorge, there’s a ton of great places to check out on your way. Spots like these will remain etched in your memory forever, but to make sure you see them all and make the most of it, a little planning is needed. The only major airport in the Top End is Darwin, so most people fly into here as the first stop unless they are driving. All major cities in Australia have daily flights to Darwin, and you can also easily reach the city from Indonesia and Singapore. If you’re planning to self-drive from Darwin, remember that in the wet season some roads can be closed due to flooding. Plan your trip with flexibility in case this does happen and you need to rethink things. It also gets very humid in this part of the world, so a car with air-con is a must for comfortable travel. You don’t need a 4WD but you can access more off-road spots if you do! Make sure you take plenty of breaks and sightseeing stops. One good thing about driving yourself is you really do have the freedom to stop where you please! You get to take in the landscapes and amazing wildlife at your own pace. There are two main seasons in the Top End – the wet season, from November to April, and the dry season from May and October. Both seasons have their highlights and the waterfalls, gorges and natural wonders in the Top End all look different during each. In the wet season, the landscape comes alive with the ample rainfall, and you’ll enjoy exploring lush, green surrounds. Temperatures during this time sit around 33-35 degrees and humidity is high. Travelling during this time is exciting, as you’re bound to witness magnificent storms roll in most days. The rain also means that the waterfalls are bound to be flowing and waterholes full, but keep in mind the abundant rainfall means that because some roads become flooded and inaccessible. Travelling during the dry season is a good idea if you prefer clear skies, warm days and cooler nights. Temperatures in the dry season are still warm and days usually reach the low 30’s. Overnight, it can drop to 16 degrees but usually, temperatures sit in the low 20’s. Visit during the Dry to explore all of the attractions in the surrounding national parks, and experience the buzz of the sunset markets. This is the Top End’s buzzing major city. There’s a relaxed outdoor lifestyle, awesome Asian-influenced food and a waterfront area that’s begging to be explored. There are also great events and markets throughout the year, so you’ll find something to do no matter what time you visit. Check out Crocosaurus Cove where you can see these mighty beasts up close. If you’re feeling brave, try the Cage of Death, where you can descend underwater with the crocs! 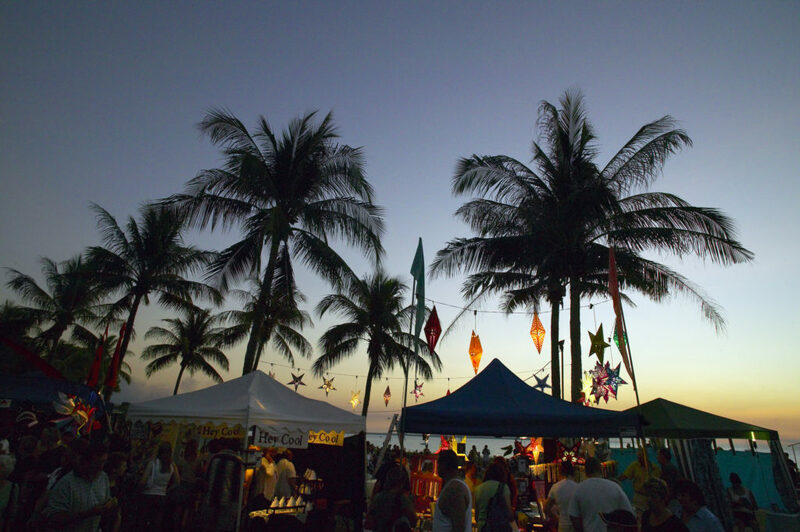 Wander around the Mindil Beach Sunset Markets held every Thursday and Sunday evening in April – October. You’ll find stalls offering delicious food from all over the world, arts and crafts goodies and entertainment. Take a dip at the saltwater Recreation Lagoon, a man-made saltwater lagoon with a mesh screen to stop marine stingers coming in. To get some swell when in Darwin you can also buy a pass to the Darwin Wave Lagoon. This incredible spot lives up to its World Heritage listing. Home to breathtaking landscapes, an abundance of unique wildlife and unique Aboriginal rock art sites and epic waterfalls to explore. 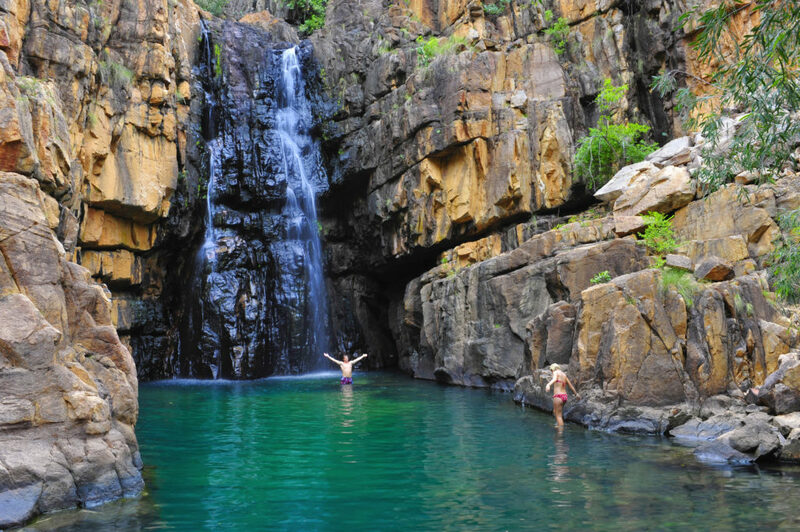 Dive into Kakadu’s natural infinity pool – the Gunlom Falls Plunge Pool. Located at the top of Gunlom Falls, a short 15 minute hike to the top will reward you with clear water and endless views of the surrounding hills. The Falls themselves are spectacular too, so bring a picnic to enjoy at the bottom. Soak up Aboriginal culture at Ubirr and Nourlangie Rock Art Sites. These spots have some of the most spectacular Aboriginal rock art in the NT, and they provide an important insight into Kakadu’s Indigenous history. Chase waterfalls at Jim Jim and Twin Falls. 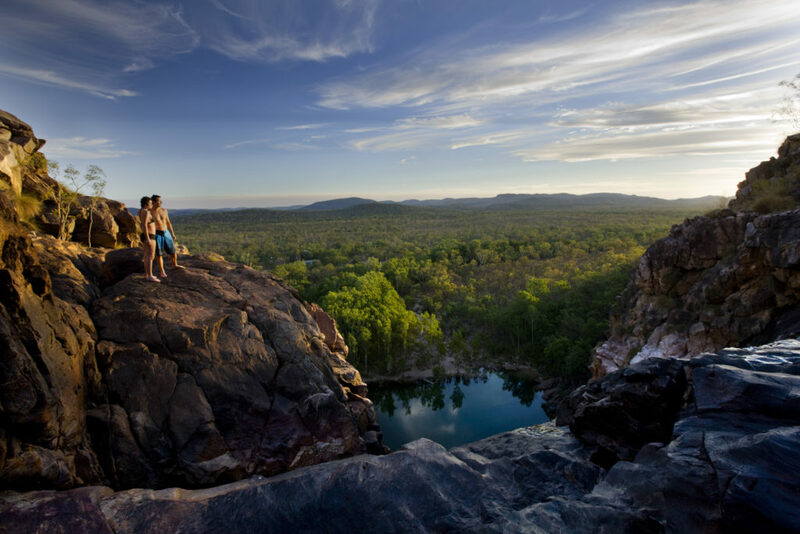 These two beauties are a highlight in Kakadu and offer visitors some breathtaking views and hikes. Jim Jim is reached via a 2 km return walk through monsoon forest where at the end you are greeted with a deep plunge pool and a majestic waterfall. A trip into Twin Falls is a short shuttle boat ride, short walk over boulders, sand and a floating boardwalk into the falls. 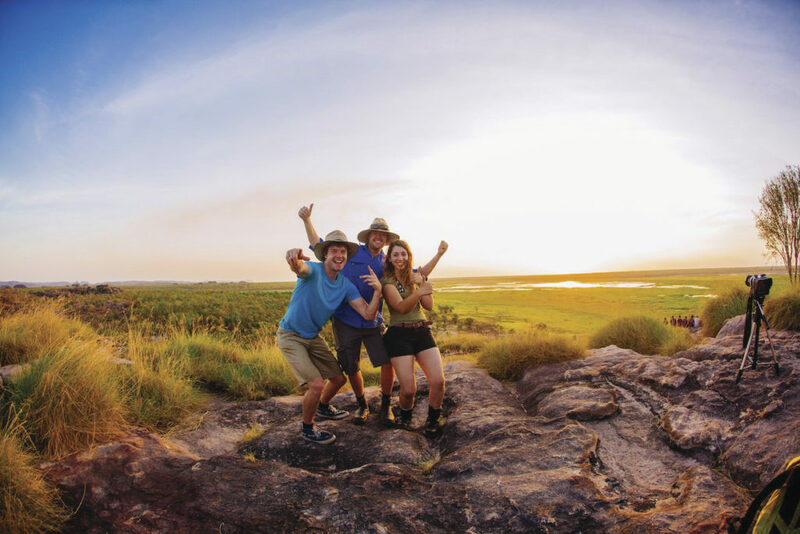 Discover Kakadu’s wildlife at Yellow Water Billabong. This landlocked body of water is home to countless types of birds, crocodiles, wild horses and buffalo. You can check out the local animals on a Yellow Waters Boat Cruise or on a walk along the boardwalk above the water’s edge. This is where the adventure starts. 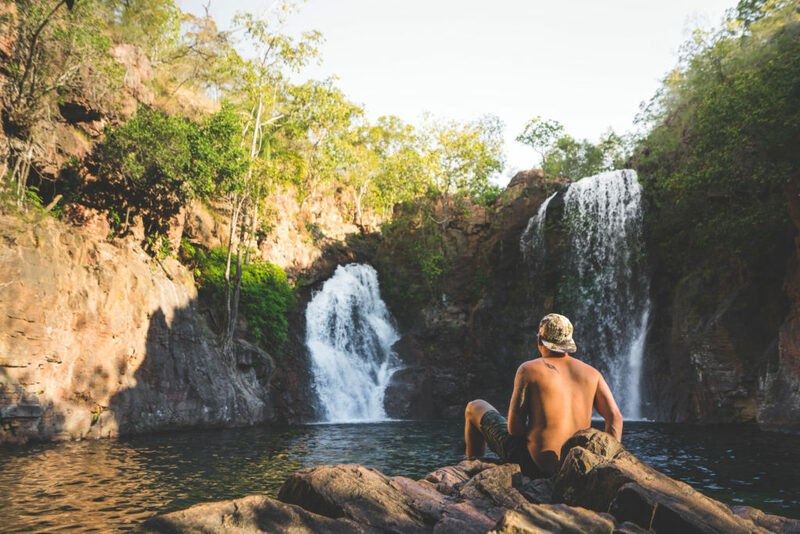 You can easily reach Litchfield as a day trip from Darwin and there are plenty of waterfalls, waterholes, bushwalks and 4WD to enjoy. 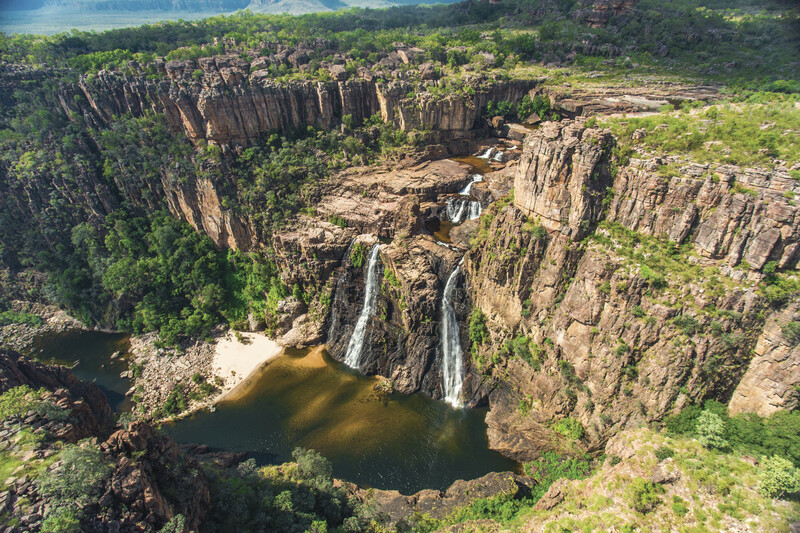 Tick off Litchfield’s list of stunning waterfalls. There’s Wangi, Florence, Tolmer and Tjaynera Falls, and that’s just a few of them! There’s plenty of brilliant walks around each of these too. A very popular and quick spot to get into is Buley Rockhole, where you can relax in your own private rock pool, a great spot to relax after exploring. Be wowed by the hundreds of termite mounds that are over 100 years old and discover the difference between Cathedral and Magnetic mounds. Find yourself in The Lost City. This series of large sandstone outcrops is reached via a slightly tricky 4WD track so you’ll need to be confident behind the wheel. This is one of Australia’s last true wilderness areas. Untamed coastlines, spectacular scenery and a strong culture await visitors. It’s remote, rugged and full of surprises. Depending on which parts of Arnhem Land you’re going to, you’ll need permits from the Northern Land Council and/or the Dhimmurru Aboriginal Corporation. Or you can visit the area with a tour company who organises permits for the area. Discover local art at one of the many brilliant art centres. Elcho Island Art and Craft and Anindilyakwa Arts support local artists promote and sell their artwork. Visit the Buku-Larrnggay Mulka Centre, a museum with houses a collection of Yolngu artefacts and bark paintings and carvings. Discover the fascinating wildlife of East Arnhem Land on the Gayngaru Wetlands Interpretive Walk to learn all about the local Yolgnu culture. The walk revolves around a lagoon with countless birds species and native plants to see along the way. Visit the Injalak Arts and Crafts Centre. There’s a range of unique Aboriginal art and crafts, all made locally, and you’ll see the artists at work. Lose yourself in Garig Gunak Barlu National Park. There’s breathtaking beaches, great treks, abundant birdlife and boating and fishing to enjoy. While you’re here, visit the Black Point Culture Centre. You’ll gain a valuable insight into the rich history of the Cobourg Peninsula and the various displays include some amazing artefacts. Embark on a Top Didj tour, an indigenous cultural experience lead by indigenous artists from the area. You can learn to make a fire using sticks, try throwing boomerangs and spears, paint your own Aboriginal artwork and cuddle up with one of the orphaned wallabies! 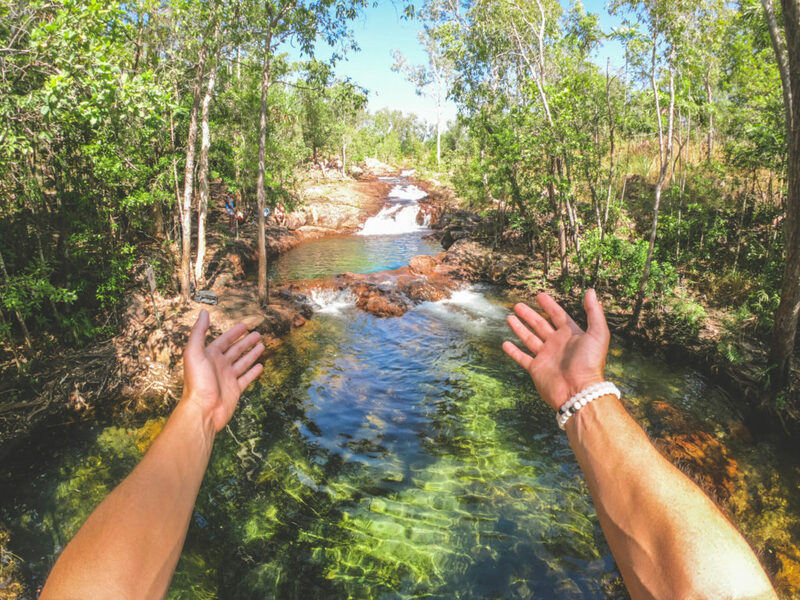 If you feel like taking a day trip from Katherine, the Elsey National Park – including Mataranka and Bitter Springs – is just the ticket. Both Mataranka and Bitter Springs are natural thermal pools, running at a guaranteed 34 degrees all year round, making them a great place to unwind and relax the muscles after a day of exploring. Explore the mighty Nitmiluk National Park, a highlight here, and there are many ways to discover it. You can canoe up the gorge with glimpses of waterfalls, Aboriginal rock art and wildlife, or opt for a more relaxing cruise. There are tons of swimming spots and sandy beaches to explore too. From Darwin, you can also head to Alice Springs, Uluru and Broome. 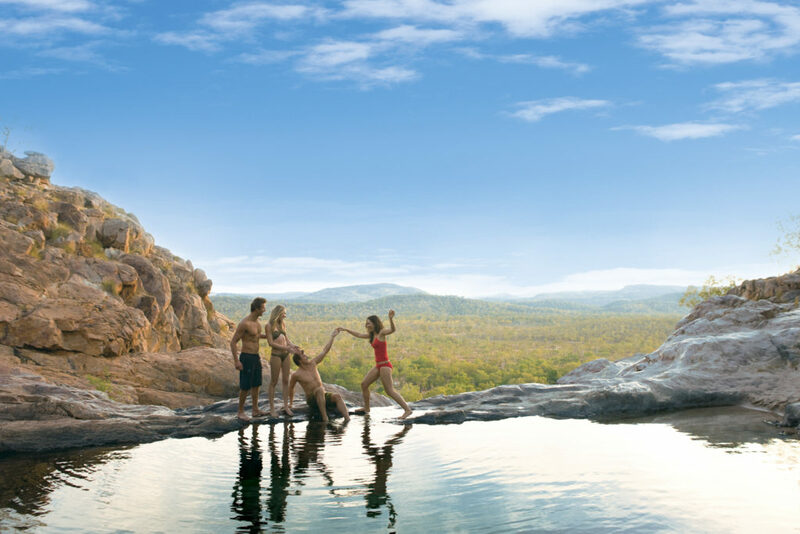 There’s no commercial accommodation in Litchfield National Park itself. Bring camping gear so you can use the campgrounds available. $15.40 per family (2 adults and 4 children). $7.70 per family (2 adults and 4 children). When you’re visiting the Top End, you need to come prepared for all sorts of weather. It’s hot and humid, and if you’re travelling in the wet season, you can expect A LOT of rain. Bring enough clothes to last the length of your journey, though there will be the chance to do washing if you’re staying in Darwin or Katherine. When you’re camping in the National Parks, access to washing machines will obviously be limited. Do your essential washing in Katherine and Darwin before you head off. Bring some laid-back apparel suitable for warm weather, and make sure you protect yourself against the sun and heat with lightweight clothing, hat, sunglasses and sunscreen and don’t forget your swimmers. A decent pair of shoes is essential too, as hikes and rock hopping are an inevitable part of any Top End adventure. A good pair of runners will do. It’s also a good idea to pack a pair of thongs or slip-ons, to wear after swimming in the hot springs or waterholes. Bring moisturiser, lip balm and sunscreen with you. Insect repellent is essential too as mosquitos can come out at dusk, especially if you’re camping near water. A pack of baby wipes is also a good idea and can act as a bush shower when you’re out camping. When it’s hot and humid a wipe with one of these can make you feel a lot better. You’ll also want to pack panadol, band-aids and any medication. Access to pharmacies are limited on camping tours, so bring anything you need. Pack a small first aid kit if you’re driving yourself or a group. When travelling in the wet season, bringing an umbrella or rain jacket/poncho can be a good idea. A water bottle is a must. You’ll need to be drinking water regularly to avoid dehydration. You’ll also need a torch or a head torch at night. It makes finding your tent and the toilet much easier. So, what are you waiting for? There’s all the information you need to go and make your dream Top End trip a reality! 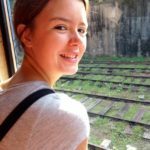 If you have any more questions, please get in touch with the Backpacker Deals team.